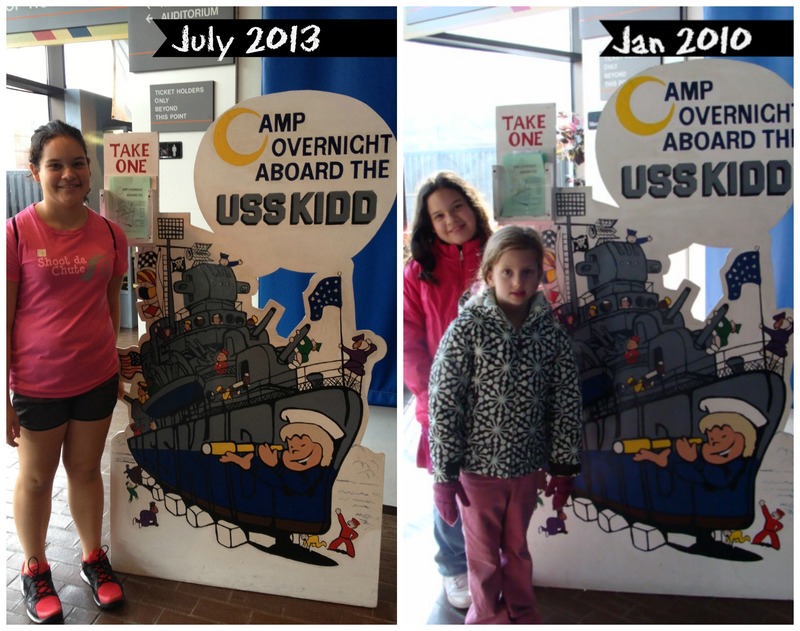 Back in January 2010, my daughter (her Girl Scout Troop) & I visited the USS KIDD in Baton Rouge Louisiana for an overnight sleepover. I have mixed feelings about our visit mostly because it was a rare freezing cold (add water and wind into the mix) January weekend + several 3rd-5th graders makes for an “interesting” weekend. But this time we visited with our family in July. I forgot that my son & husband have never visited the USS KIDD so I knew it would be an eventful day. USS Kidd is a Fletcher-class destroyer & was the first ship of the United States Navy to be named after Rear Admiral Isaac C. Kidd. Kidd died on the bridge of his flagship USS Arizona during the attack on Pearl Harbor. The “Pirate of the Pacific” is located in downtown Baton Rouge, Louisiana in a historic area where she serves to memorial to honor the men and women of our American armed forces. Every time I go to a museum in our area, I try to take home several new tidbits of information. It makes me want to revisit a museum and bring new information back with me. On this trip I learned that NO FUNDING from either the state or the federal governments goes to funding the Memorial. All funding for the Memorial comes from donations, ticket and gift shop revenues, scout overnight camping, military reunions, and special fundraisers every year. Reasons like this would want me to visit more regularly. For me, why wait until your child comes to visit with his school or an overnighter through scouts. This is the perfect place to visit with your family and sight see in Baton Rouge. When we arrived at the USS KIDD we visited the museums after visiting the destroyer due to the rain. Since I have “all the luck” in the world, what turned from an overcast morning turned into fulfilled thunder, lightning and hard rain. We were literally going in and out of the ship in order to stay dry. I know for a fact she saw every inch of the USS KIDD from the inside. Then, we ran to the museum in the hard rain. I managed to get some fun pictures before the heavy rain occurred. I LOVE this picture! When I started my blog well over 4 years ago it was to document my life in the New Orleans area and our journey through Girl Scouts. Never did I think over 4 years later I would still be writing about our experiences. Although this picture is a little over 3 years ago, it is clearly a milestone to where my blog started and where it is now. Hasn’t she grown so much? My Saraita is now a teen! Visit USS KIDD at their website, Facebook or on more on Baton Rouge Twitter. Wow, these have to be some of the coolest pictures I’ve seen! My boys (hubby included!) would LOVE to check all this out in person! Wow – that is awesome! Looks like a great place for kids and adults to have fun while learning at the same time. I love the picture of your son on the stairs! And your daughter is growing into an amazing young lady! I’m so glad that thanks to blogging we have finally met in person! I had no idea they were pretty much self-funded! Those are pretty cool pictures! Lovely plan. My son would DIE to go on this tour!!! AWESOME! What an awesome, fun plane!! I’m really impressed that they don’t receive any funding… only donations and such. That’s wonderful! We are supposed to have a Scout overnight on an air carrier this year. I am going to show my son your pictures. He will be even more excited now!! Awesome! I also have a son who loves exploring ships like this! A sleepover? That sounds like so much fun! What a great thing for the family to do! She may be a teen, but she has la misma carita de niña bonita. Pity you spent the day dodging the rain, but glad it made for a good post! ; ) BB2U P.S. 4 years blogging? Wow and woah.